These horses are truly a Using Horse! 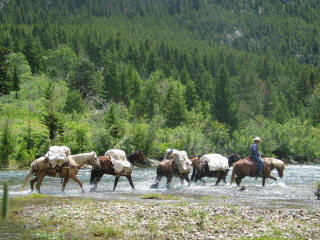 All Hashknife horses get experience with a pack saddle on their back. They will experience packing in the broken hills of Montana, but many also pack in the rugged wilderness of the Beartooth, Belt, and Snowy mountains. At left, Brandon lightly packs a couple 30 day colts while riding a third. 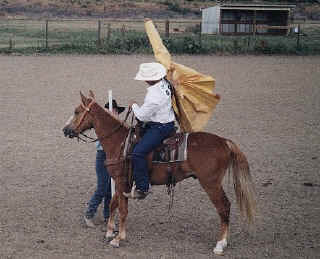 Clients may request horse packing experience for their own horses. At Hashknife Horses, we customize the training to your needs. 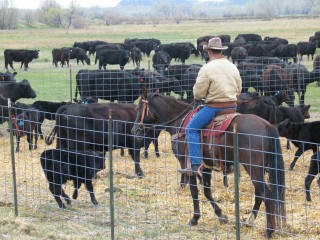 Living in ranch country, all Hashknife horses get the opportunity to work cattle. This includes gathering, sorting, roping, or doctoring cattle throughout the year. These are well versed ranch horses that can be used for your every need. Pictured at left is Brandon on a gelding during the Miles City Open Quarter Horse Show. This gelding has a total of 16 rides including this participation. This is a testament to the responsiveness and willingness Brandon instills early in his horses with his training techniques. The horse placed 2nd in this “Working Ranch Horse” class. 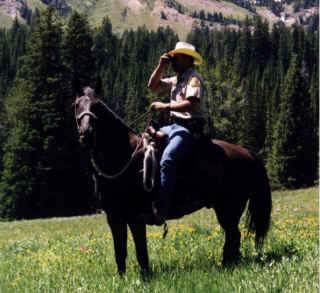 Brandon spent 10 years working as a Montana Game Warden. 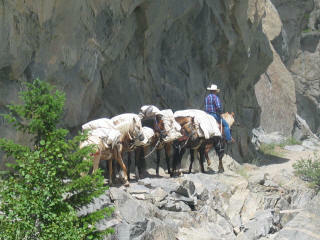 He has used Tennessee Walkers for all aspects of backcountry patrol work in the Rocky Mountains of Montana. These gaited horses have out performed other horse breeds hands down. Walkers are a calm breed that are dependable, fast, and have tremendous endurance. Their smooth gait keeps those long days in the saddle from becoming tiring. Because we are gaited horse breeders uncompromising to our breeding principles, we consistently produce horses that are fit for all disciplines and riders of varying abilities. We are not interested in just selling horses; we match our horses to you. Our horses are known for their sweet disposition and ability to excel in a variety of challenging situations while giving the rider that smooth, fast gait for which they are renowned.